Whether you are new to investing, an expert in real estate investing, or just thinking about it as a possibility, everybody can use a little guidance with tried and true methods to maximize your earnings. There is a reason why this book is titled “The Book on Rental Property Investing” because after reading it, I can attest that it literally should be The Book that should serve as the ultimate source for success in this area. Pick Up Your Copy Here and Start Investing! This best-selling book by Brandon Turner, subtitled “How to create wealth with passive income through smart buy & hold real estate investing” provides practical, real-world advice on how to have financial success through rental properties. It contains nuggets that can help even the most seasoned real estate investor, but where it really shines is how easy of a framework it lays out for those who are just beginning to invest their money in this field. 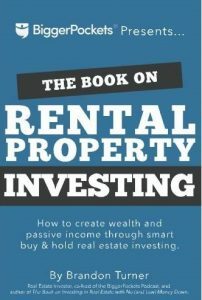 If you’ve thought of building your net worth by using rental properties, both for the passive income it provides as well as the real estate asset it can be, this book is an absolute must-read. It contains around 400 pages of in-depth strategies and advice that is laid out in simple terms for even the most novice to understand. You will learn how to lay out a plan that is achievable, how to find great deals for undervalued properties that can provide the most upside (like through foreclosure deals that you can find here), how to finance your property purchase, how to manage your properties, and much more. There are so many books out there that provide information on rental property investing. However, none of them can match this book in the way that it lays out a simple, step-by-step framework that if followed can lead to tremendous success in real estate investing. Even more than that, I like that it caters to all audience in terms of finances. It makes this area of investing a reachable goal to anyone who wants it, no matter your current financial situation. I also like that he presents many different methods to success and leaves it up to the reader to analyze their current situation (finances, location, etc.) and decide what is the best route for them. With other books on this topic, the author mostly talks about what they exactly did, and makes it sound like no other strategy will work. Turner provides a comprehensive framework that can help find the right answer for everybody looking to invest in real estate. Brandon Turner is a veteran investor in real estate, both through rental properties as well as flipping houses. He clearly has the first-hand knowledge and success stories to add legitimacy to his teachings in this book. When he’s not actively working on his real estate portfolio, he is the co-host of the TheBiggerPockets podcast, a popular business podcast. He regularly writes for Forbes.com and Entrepreneur.com and is the author of other top-selling books on real estate.